I use a lot of different modes and methods for my commute to work. For the past two years I’ve been both a local and regional commuter for my jobs- two days a week, I drive to Cal Poly Pomona (I teach Urban and Regional Planning) and then I use a multimodal mix to get from Highland Park, where I live, to LADOT, Downtown. From home, all methods take roughly the same amount of time. Driving in morning traffic takes about 35 minutes. By train, I walk a couple blocks to the Metro Gold Line and then walk a few more, from the Little Tokyo Station to 1st and Main, which takes 40 minutes. And then biking takes around 37 minutes. I really love riding my bike to work. It’s actually the way I like to ride most. I think a lot of people prefer social rides- I like bike rides as a meditative time or else time I have one-on-one with a friend so we can talk. It’s just such a great way to start your morning, with all the visceral things you experience while riding a bicycle. The neighborhood smells different in the morning… trees and plants are just opening up, there’s still some dew in the soil and then there’s the birds, everywhere, making noise and singing their songs (if you’re familiar with Northeast LA, you know I really mean screeching parrots). Due to its hilly terrain and abundant historical streams, Northeast LA has a lot of microclimates. Often the moisture in the air makes for a magical foggy ride… totally into the magic bike ride! People are also doing different stuff in the morning. Everyone’s getting going and starting their day, there’s an energy outside… When you ride a bike you’re making eye contact with all kinds of people. You’re seeing things around, you are the eyes on the street. This is a social experience that you don’t have when you ride in a car. My route starts in Highland Park. My street is not very good for people because it’s also an on-ramp to the 110 Freeway. Since living at my place I’ve seen a cat, many cars, and even a person hit by drivers because it segues into the freeway on-ramp. Needless to say, the active transportation challenge starts with leaving my front door. 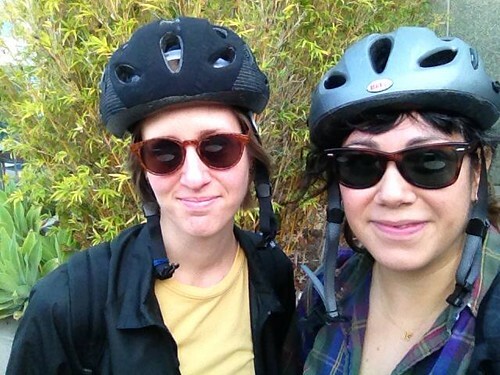 I have biked by myself to work but I prefer to bike with a friend because it feels safer. Normally I meet up with my friend Jamie and we bike-pool! Jaime and I went to grad school together for Urban Planning and she lives(ed) up the hill from me. We both work Downtown- Jaime works in Chinatown, which is on the way to my job. We’ve been biking to work together since 2013 which has been a great way to stay in touch after graduation. Jaime just moved further north and east, but we still plan on biking together, since she can multi-mode it on the Gold Line to Highland Park. Jamie and I meet at the intersection of Avenue 57 and Via Marisol where we then take back roads through Highland Park to get to Avenue 52 (which turns into Griffin, which is eventually a buffered bike lane). There’s no direct route other than the freeway, so we do this weird little jog through the neighborhood. This part of the ride is like the video game Paperboy: there’s a lot of stuff going on; a lot of people pulling in and out of driveways, debris, bad pavement, dogs chasing you, cats, trash bins… very scenic! Then we get to the sweet, long stretch which is why we take this route. Griffin is a neighborhood street which is sharrowed, then becomes a bike lane, and then turns into a buffered bike lane, which is basically the Cadillac of bicycle facilities on the Eastside. This whole stretch on Griffin is very comfortable and pleasant. If the whole city had this kind of infrastructure and connectivity, I would bike everywhere. But alas. Then comes the cold hard reality of Main Street. Oh Main Street… Main Street is in my opinion the best way to go because it doesn’t have as many cars (people commuting in the morning and the evening can get pretty agro, I like to stay away from them!) and the road is relatively well paved, unlike some of its parallels. The unfortunate piece is that cars that drive on Main St. drive very fast, which is scary for me… Taking the lane is pretty doable here and I definitely do this when I ride because the lane widens and narrows throughout and if you’re not taking the lane, it is possible that you might have a speed and space conflict with cars that would be driving between 35 to 50 miles per hour. I don’t take that risk of fighting over space on the road, I just take it. These fast cars are another reason I primarily only feel comfortable biking with a friend; together we’re more visible as well as more justified to take the lane. From Main, I drop Jamie off and then head on to Los Angeles Street which takes me straight to work in a buffered bike lane. Luckily my job supports me biking to work! 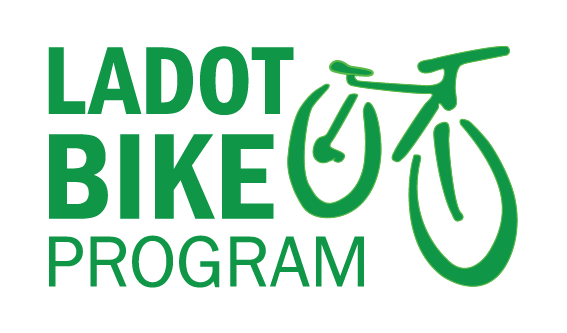 I can get a monthly stipend if I walk or bike at least 50 percent of my trips to work. There’s also a shower I can use upon arrival with a day use locker for my clothes. This is especially important because I have a job where I need to look professional and go to meetings without looking like I rode my bike six miles to work. There are also multiple secure places to lock my bike. A bunch of people bike to work in the Caltrans building… my boss even has a bicycle locker on site, cause she’s the Bike Boss. 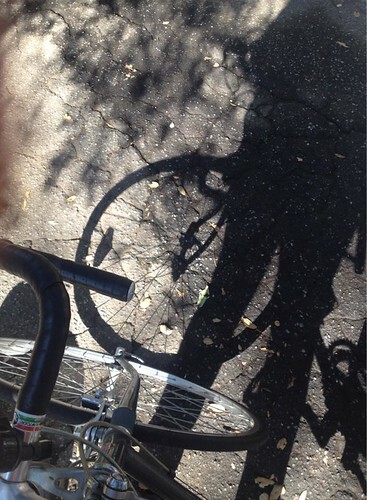 There’s some stuff that I’ve learned to do in my time biking to work that I’d like to share. 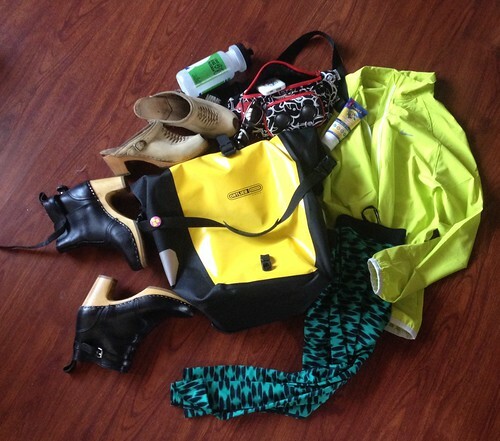 Early on, I realized two things: the first is that I don’t want to carry all my stuff on my body (ew, sweat!) and the second is that I need some jams to get me through the traffic. Like camping, biking to work is comfortable when you are well prepared. For me that means packing my panier (especially my clothes!) the night before so I don’t forget important things when I am sleepy in the morning. I keep a set of toiletries at work so I only have to carry my change of clothes. For the jams, I invested in a Jammypack, which all my friends will attest is the coolest part of my bike ensemble. A Jammypack solves the problem of wanting to listen to music but putting yourself at risk by wearing headphones (never do this, it’s very dangerous and illegal!). My Jammypack has a rechargeable battery and plugs into my iPhone’s headphone jack. More recently I got some serious bike-to-work clothes which includes a fluorescent yellow lightweight jacket and some really comfortable leggings. I noticed when I wear the jacket, people in cars do not come as close when they pass me. The last thing I want to say about the ensemble is that biking in some kind of heels is actually really nice because it gives you pull that you would have if you had clip on shoes. I really like clogs and my clogs make great bike to work shoes! These are just some of the things about my bicycle commute to work. Elizabeth Gallardo is an Assistant Bicycle Coordinator in LADOT’s Active Transportation Division. Is the traffic the reason you don’t use the bike lanes on Mission to connect to Cesar Chavez? I’m guessing Mission is the better of the two streets and Cesar Chavez probably gets pretty crazy in the morning, particularly on the bridge, but I’ve never ridden there before. Nice write-up. What do you do for lights and tools? For me, I carry: pair of Pedros tire levers, patches and spare tube, a CO2 inflator, a Park IB-3 mini-tool. For lights: a Light and Motion’s Vis 180 tail light (rechargeable, bright, but $$), Serfas TSL-1800 headlamp (brighter than BMW car lights, but $$). I ride with lights on at all times, even during the day. Take Figueroa, left at Cypress, enter the foot bridge, exit foot bridge and take Artesian to Humboldt. Left on Avenue 20, Right on Pasadena. Merg onto Broadway bridge. Left on Ord, right on Spring. I can get to city hall in a snap using my route. You’re adding 10 minutes in climbing on what should be nearly 100% of a downhill ride. 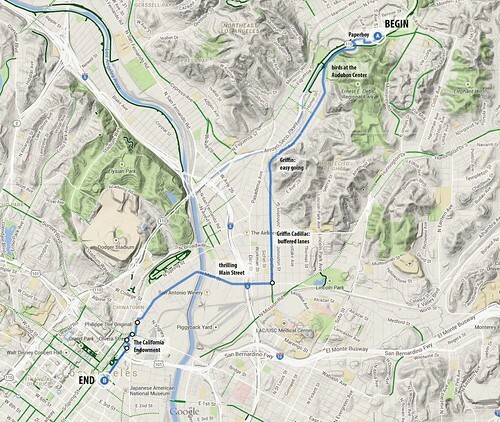 Now I am compelled to make my own blog post about the best and FASTEST routes to DTLA. I haughtily shake my hippy hair bun at you in smug satisfaction that I know a better way. Maybe it feels socially safer (no empty industrial spaces) on her route. Thank you for posting this! I also live in Highland Park and love to ride my bike to work (Chinatown) — getting home with the hill at the end is the only hard part! I’ll have to join you guys sometime! Great write up, Elizabeth! I bike commute from Pasadena to City Hall, and I also take Griffin to Main to Alameda to Los Angeles. To get from Main to Los Angeles, do you take that short stretch on Alameda? It’s horrible for bikes– lots of trucks, busses and aggro drivers. Any suggestions for an alternate? I gotta agree with ubrayj02. I used to go from Eagle Rock to 3rd/Bixel and aside from shooting down Eagle Rock Blvd, I used his same route. I was always there in 37-40 minutes.